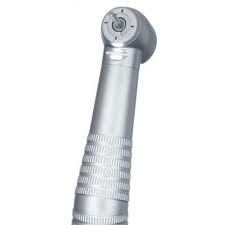 Most dental handpiece manufacturers provide a selection of head sizes to accommodate the dentists needs for the appropriate speed and dental handpiece torque. Often they are classified as large, standard, and mini. Many manufacturers feel the most limiting measurement is front to rear, which is tip of the chuck to very back of handpiece head. This measurement will typically be around 12 mm, or so, and helps determine the height of handpiece with selected bur installed. Torque heads are typically larger. Some would say wider (around 13 mm). Either way, the wider design contains a larger impeller, which delivers more torque. Since the larger impeller produces more power with a given amount of air, speed is reduced, resulting in a little less noise. Standard heads are, in most cases, the best choice for multiple uses, providing adequate dental handpiece torque. The one pictured left is a little longer front to rear. This design allows for a little more chuck surface providing very good hold on bur for the higher speeds which accompany this size. The longer rotor also adds stability, helping to minimize vibration at speeds approaching 450,000 rpm. Mini heads are typically smaller front to rear, and total diameter. Smaller heads produce less dental handpiece torque and operate at higher speeds. Higher speeds, as a rule, produce more noise. Of course, these may be necessary evils when dealing with pedo applications, smaller mouths, and those patients with limited range of jaw movement. Bearings can also be a limiting factor in dental handpiece torque. 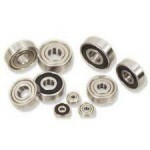 Bearings are very specialized and must be chosen with a high degree of accuracy for each application. Some designs are capable of producing very good torque at slower speeds, but will quickly lose effectiveness at higher speeds, as heat and other factors must be taken into consideration. The expansion and contraction resulting from the rigors of the dental environment will quickly affect bearings not designed for such. Myonic, Timken, NHBB, Barden, and NSK are considered among the most highly rated for this application. Impellers are made from composite materials which tend to handle the harsh environment of the autoclave without excessive expansion or tendency to become brittle. Impellers which are not properly balanced can greatly effect torque, especially when varying handpiece speeds are required to complete a preparation. All dental turbines have critical speeds (speeds at which turbine operates at a higher vibration level). Well balanced impellers help to reduce this range to a minimum, resulting in more constant torque throughout. Some impellers are not balanced at all. This combined with less expensive (and effective) bearings is why you may find a wide range of turbine prices on the internet. In many cases these turbines will provide very good service. I guess buyer beware is in order here. If you replace turbines yourself, take a close look at the impeller. Balanced impellers will typically have small indentations on one or more of the impeller blades, often in a different color. Of course, turbines with less expensive bearings, and unbalanced impellers are good choices for some, when absolute maximum dental handpiece torque is not required. However, if you are the type to drive a Mercedes, you may expect it to run like one.